This limestone tree stump monument was carved for 7-year-old Eva Lou Gaussin. Her hat and high button shoes are resting with lilies and ivy. These are symbols of innocence, resurrection, and eternal life. The roses beneath her shoes, a dove lying dead on the stump, and a crucifix with a wreath stand for the brevity of life. 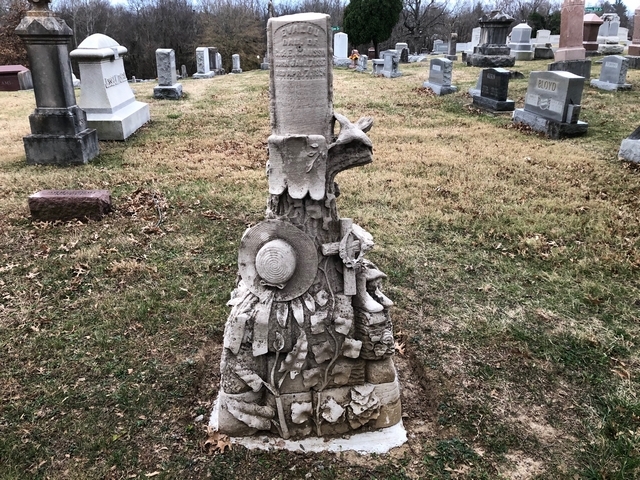 The Bedford Mail (April 19, 1895 - Page 3) printed the following news: "Eller Taylor & Co. have put up one of the handsomest rustic monuments in the State at the grave of Evalou Gaussin in Green Hill Cemetery."